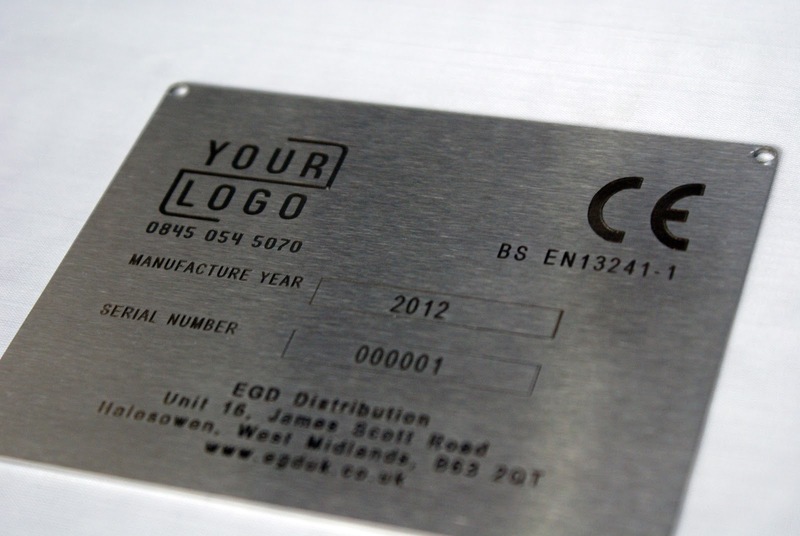 EGD (Easygates Distribution) is offering their customers laser branded products and CE marking plates. A twenty thousand pound investment into laser equipment means that EGD does this in house with minimal turnaround times. Everything from photocells, intercoms, junction boxes to keyfobs can be laser marked with your company logo and contact details. Serial numbers can be added to remote controls for asset tracking. The marine grade stainless CE plaques are available in a number of sizes and give an indelible marking method as the regulations require. The overall effect gives a more powerful company brand and advertises your company to others. EGD offers this service as part of their bespoke attitude to a customer’s needs. ‘By meeting with customers and discussing their needs we try to bespoke solutions directly for them in the way of equipment, training, safety and branding. This new investment allows us to supply quality personalised automation products with small minimum quantities and with a fast turnaround time. ’ – said Tony Gooding , director at Easygates distribution. A Free personalised sample of a CE marking plaque is available by emailing your company logo (preferably in vector format) to Tony@easygates.co.uk. For more information call EGD on 0845 054 5070.